A photo of David Tennant and Michael Sheen signing a Good Omens poster has been posted online. A photo of David Tennant and Michael Sheen today after being interviewed in London about Good Omens has been posted online. Mary, Queen Of Scots is released in Singapore today. Mary, Queen Of Scots is released in France and Belgium today. David Tennant Daily News Digest for Monday 25th and Tuesday 26th February 2019 (10 items). Mary Queen Of Scots is released on DVD and Blu-ray in the US today. 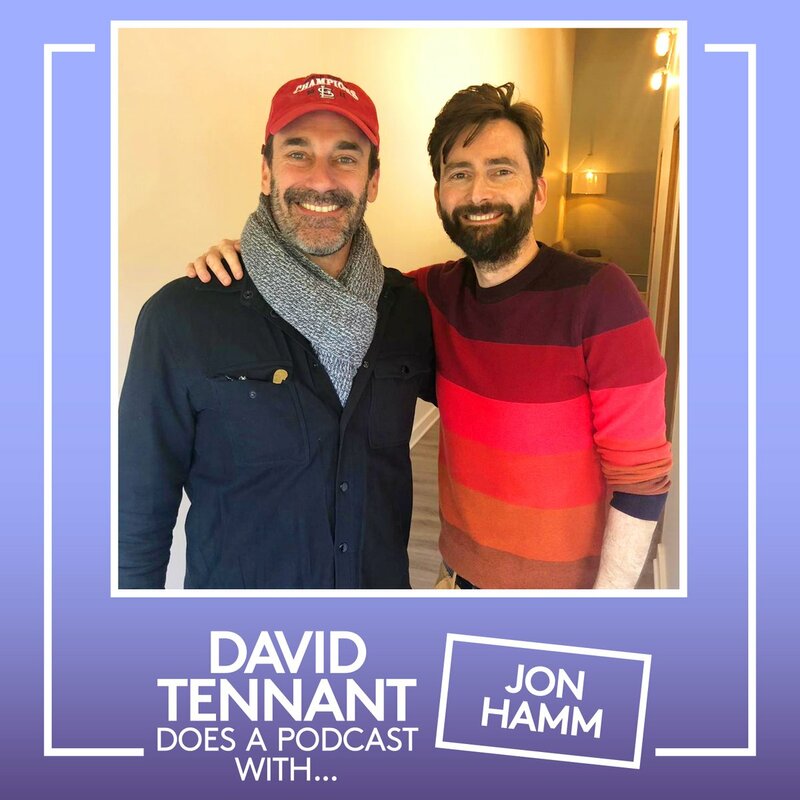 A photo of David Tennant with Jon Hamm from his podcast has been posted online. The fourth episode of Camping (Up All Night) has its Australian television premiere tonight on Fox Showcase at 8pm. David Tennant Does A Podcast With... Jon Hamm is online. 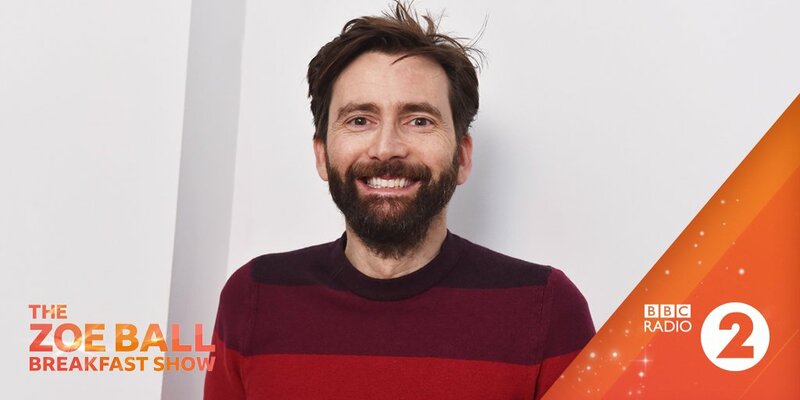 David Tennant will be one of the presenters hosting the televised live show on Comic Relief's Red Nose Day on Friday 15th March. Unfortunately Mary Queen Of Scots didn't win either of the two Oscars it was nominated for last night (Costume Design Award and the Hair And Makeup Award). David Tennant Daily News Digest for Sunday 24th February 2019 (6 items). A video clip of David Tennant speaking about his next podcast (which will be released on Tuesday) with actor Jon Hamm has been posted online. David Tennant and Matt Smith to share a panel at Chicago Comic And Entertainment fan convention. As well as sharing dual photo ops both on Saturday 23rd March and on Sunday 24th March, both actors will appear at a one hour Question And Answer panel at 11am on Sunday 24th March. Broadcast of new DuckTales episodes resumes in the US on Saturday 9th March. The broadcast of the new episodes from Season Two will resume on Disney Channel with the episode What Ever Happened To Della Duck?! at 8am that day. The winners of the Oscars are announced tonight. Mary Queen Of Scots movie received nominations for the Costume Design Award (Alexandra Byrne) and the Hair And Makeup Award. David Tennant Daily News Digest for Saturday 23rd February 2019 (4 items). On its first day of release in the US yesterday How To Train Your Dragon: The Hidden World it brought in $17 million which is the largest opening of any movie in 2019 so far! The first series of DuckTales concludes in the UK today. The Shadow War! has its UK premiere on Disney XD at 9.30am. The Shadow War! is the one hour series final episode which is composed of two parts - The Night Of The Spell! and The Day Of The Ducks! David Tennant Daily News Digest for Friday 22nd February 2019 (4 items). How To Train Your Dragon: The Hidden World is released in the US today. David Tennant voices two characters in the movie - Spitelout and Hivar The Witless. It was first released in the cinemas in Australia on Thursday 3rd January and in the UK on Friday 1st February. Marvel's Jessica Jones has its French television premiere tonight. The first 3 episodes will be broadcast on the station TF1 S�ries Films. David Tennant Daily News Digest for Wednesday 20th and Thursday 21st February 2019 (7 items). The final two episodes of Camping (Birthday Party Parts One And Two) have their UK premiere tonight. David Tennant's first Warhammer Adventures audiobook (Attack Of The Necron) is available on CD in the UK today. Marvel's Jessica Jones to have its French television premiere on Friday. David Tennant Daily News Digest for Monday 18th and Tuesday 19th February 2019 (10 items). A video of David Tennant and other actors supporting Equity's Safe Spaces campaign has been posted online. David Tennant's first Warhammer Adventures audiobook (Attack Of The Necron) is available on CD in the US. Mary Queen Of Scots is released on digital download in the US today. A photo of David Tennant with Sir Ian McKellen has been posted online. The third episode of Camping (Fishing Trip) has its Australian television premiere tonight on Fox Showcase at 8pm. David Tennant Does A Podcast With... Sir Ian McKellen is online. David Tennant Daily News Digest for Sunday 17th February 2019 (4 items). 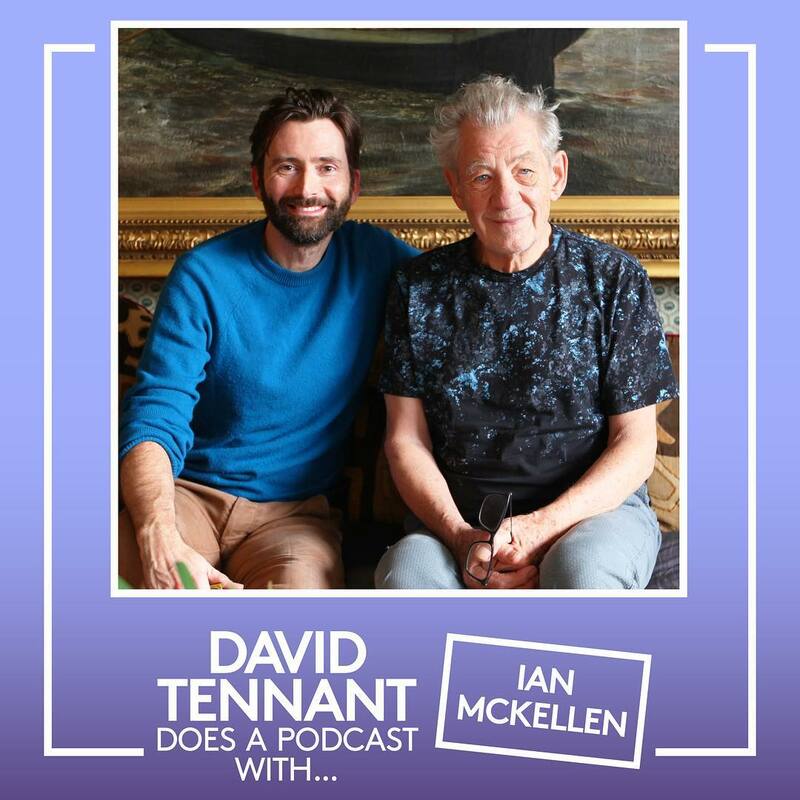 A video clip of David Tennant speaking about his next podcast (which will be released on Tuesday) with Sir Ian McKellen has been posted online. Bad Samaritan has its British television premiere today. David Tennant Daily News Digest for Friday 15th and Saturday 16th February 2019 (10 items). David Tennant to speak at #March4Women on Sunday 3rd March in London. David Tennant's first Warhammer Adventures audiobook (Attack Of The Necron) is available on download today. A photo of David Tennant (which was taken in September) with a Maradiva Magazine has been posted online. A new episode of DuckTales (The Last Crash Of The Sunchaser!) has its UK premiere on Disney XD. A new photo of David Tennant, Michael Sheen, Neil Gaiman and Douglas Mackinnon from the Good Omens panel on Wednesday has been posted online. Good Omens book to be republished with a photo of David Tennant and Michael Sheen on the cover. Currently the book has a publish date in the US of Tuesday 5th March and in the UK of Thursday 2nd May. David Tennant Daily News Digest for Wednesday 13th and Thursday 14th February 2019 (16 items). A new photo of David Tennant from his interview in The Observer last Sunday has been posted online. Photos of David Tennant at the Good Omens panel at TCA yesterday. The fifth and sixth episodes of Camping (Just Plain Mad and Carleen?) have their UK premiere tonight. Mary, Queen Of Scots is released in Brazil today. Another photo of David Tennant at the Good Omens panel at TCA today has been posted online. Three new images/artwork from Good Omens have been posted online. A great photo of David Tennant, Michael Sheen, Neil Gaiman and Douglas Mackinnon from Good Omens filming has been posted online. 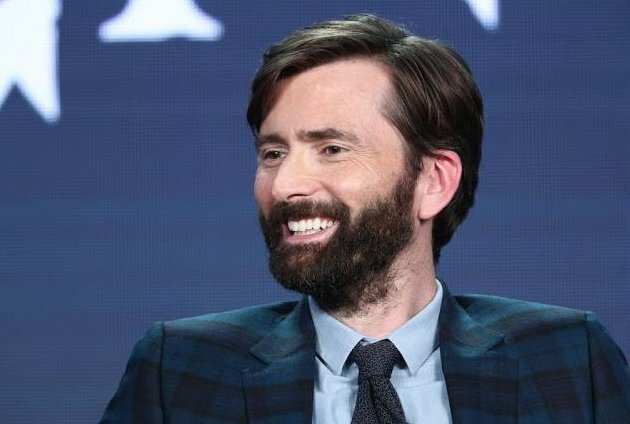 The first photo of David Tennant at the Good Omens panel at TCA today has been posted online. It was also announced at the Good Omens panel at TCA today that Benedict Cumberbatch is playing Satan. A video announcing the Good Omens start date has been posted to YouTube. The release date for all six episodes of Good Omens on Amazon Prime will be Friday 31st May it was announced at the Good Omens panel at TCA in Los Angeles today. It will be shown on BBC Two about six months later. David Tennant has voiced a video for the charity Marie Curie about the Daffodil Standards which has been posted to YouTube. David Tennant Daily News Digest for Tuesday 12th February 2019 (7 items). A video of David Tennant's full interview on Magic FM last week about his podcast has been posted to YouTube. A new photo of David Tennant supporting Equity UK's My Card My Union Campaign has been posted online. 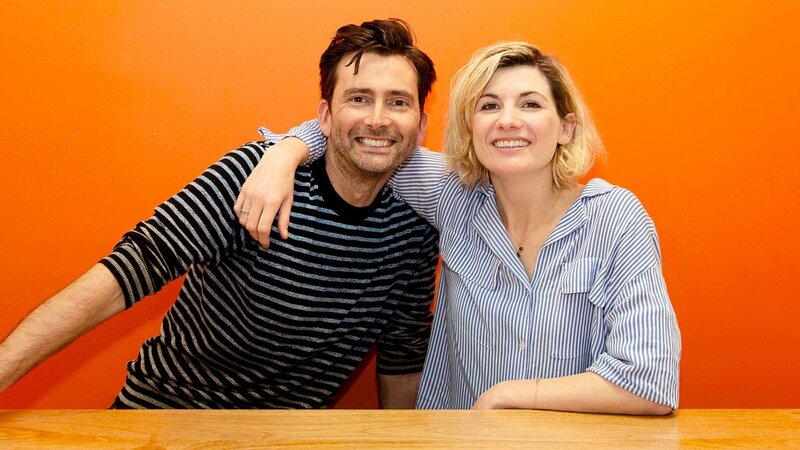 A new photo of David Tennant with Jodie Whittaker has been posted online. David Tennant Does A Podcast With... Jodie Whittaker is online. The second episode of Camping (Going To Town) has its Australian television premiere on Fox Showcase tonight at 8pm. David Tennant Daily News Digest for Monday 11th February 2019 (3 items). You, Me And Him is released on DVD in the UK today. David Tennant Daily News Digest for Sunday 10th February 2019 (6 items). Unfortunately Mary Queen Of Scots didn't win any of the BAFTAs tonight. A video of David Tennant promoting his podcast with Jodie Whittaker where he climbs out of a TARDIS has been posted online. The Observer has a new interview with David Tennant about his podcasts, Doctor Who and Good Omens. The link also includes a new photo of David. The winners of the BAFTAs are announced tonight. Margot Robbie was nominated for Best Supporting Actress for Mary Queen Of Scots, plus the movie has also been nominated for the Costume Design and Hair And Make-up awards. David Tennant Daily News Digest for Thursday 7th to Saturday 9th February 2019 (17 items). This was announced at the Television Critics Association Winter Press Tour today. David joined in the panel via satellite. An interview with David Tennant about Mary Queen Of Scots movie will be in the next issue of The Scots Magazine which celebrates its 280th birthday today! A photo showing their first ever issue from 1739 plus one with David on the cover has been posted online. A new episode of DuckTales (Who Is Gizmoduck?!) has its UK premiere in the UK on Disney XD today. A Question And Answer with David Tennant will be published in The Observer on Sunday. DramaQuarterly has posted an interview with Neil Gaiman about Good Omens including some (old) quotes from David Tennant. A photo of David Tennant with Jodie Whittaker has been posted online. 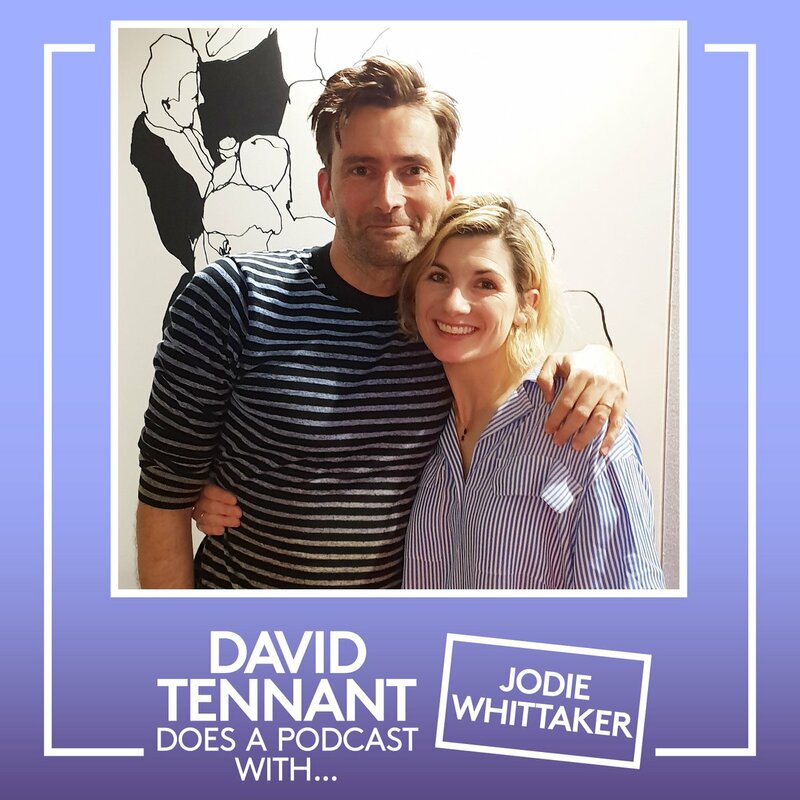 David's podcast with Jodie will be available on Tuesday. David Tennant voices two characters in the new How To Train Your Dragon: The Hidden World movie. David voices Spitelout again and a new character called Ivar the Witless. How To Train Your Dragon: The Hidden World was first released in Australia on Thursday 3rd January 2019 and in the UK on Friday 1st February. It will be released in the US on Friday 22nd February. Mary Queen Of Scots is released in Spain and Sweden today. Another short video clip of David Tennant on Magic Radio from earlier this week has been posted to YouTube. A short video clip of David Tennant on Magic Radio from earlier this week has been posted to YouTube. The episodes are Fishing Trip and Up All Night. David Tennant Daily News Digest for Wednesday 6th February 2019 (5 items). The Hollywood Reporter reports that David Tennant, Neil Gaiman, Douglas Mackinnon, Michael Sheen and John Hamm will present exclusive clips of Good Omens at SXSW Film Festival in Austin, Texas. 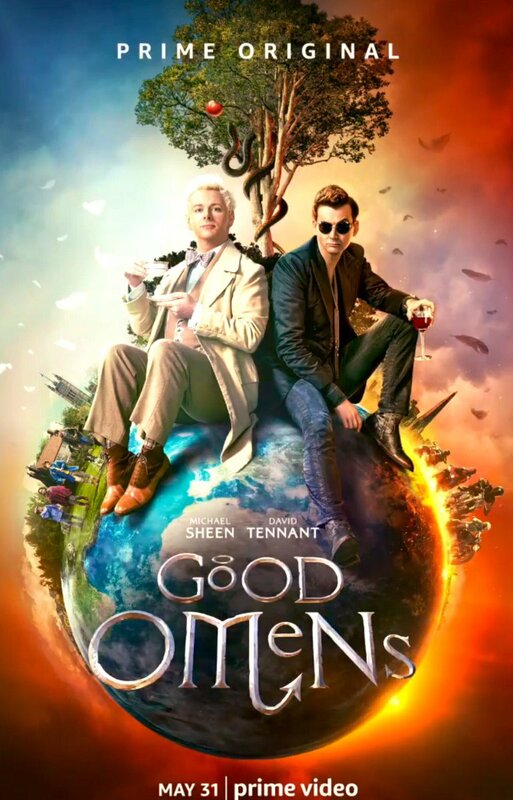 According to the SXSW Film Festival schedule the Good Omens screening is scheduled for Saturday 9th March at 6.30pm at Zach Theatre. Another short clip of David Tennant on Absolute Radio on Monday has been posted online. The extra and final David Tennant edition of Doctor Who The Complete History is published. Issue #90 includes a look at the episode Time Crash. David Tennant Daily News Digest for Tuesday 5th February 2019 (8 items). MP3s of David Tennant's interview on Magic Radio which was broadcast today. The Wizards of Once: Twice Magic is released on CD in the US today. A photo of David Tennant with Whoopi Goldberg has been posted online. A photo of David Tennant with Magic Radio DJs Harriet Scott and Tom Price has been posted online. The second David Tennant Does A Podcast With... is online. In this podcast David chats with Whoopi Goldberg. Whoopi reveals she asked the BBC if she could be The Doctor! Camping has its Australian television premiere on Fox Showcase tonight. David Tennant Daily News Digest for Sunday 3rd and Monday 4th February 2019 (12 items). Video of all of David Tennant's interview on Absolute Radio today has been posted to YouTube. MP3s (which play worldwide) of David Tennant on Absolute Radio today. A video clip of David Tennant speaking about accents on Absolute Radio today has been posted online. 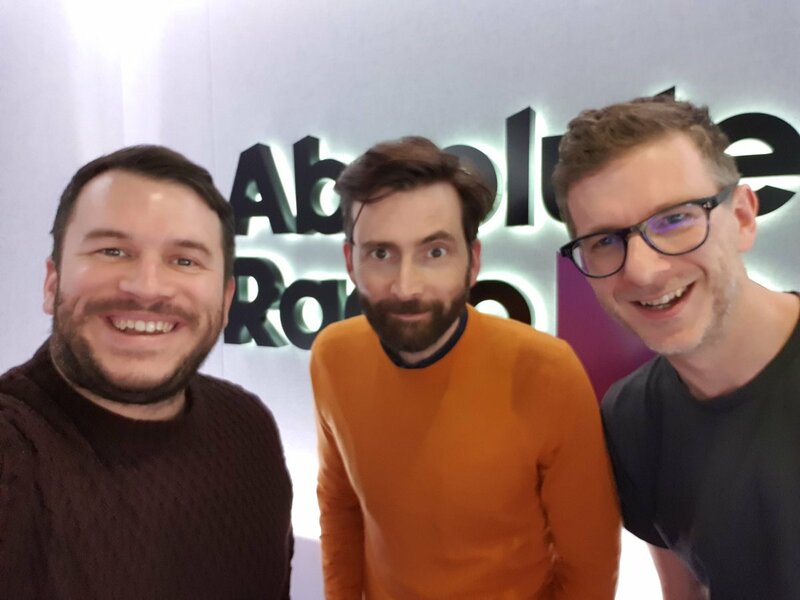 The first photo of David Tennant with Andy Bush and Richie Firth at Absolute Radio today has been posted online. 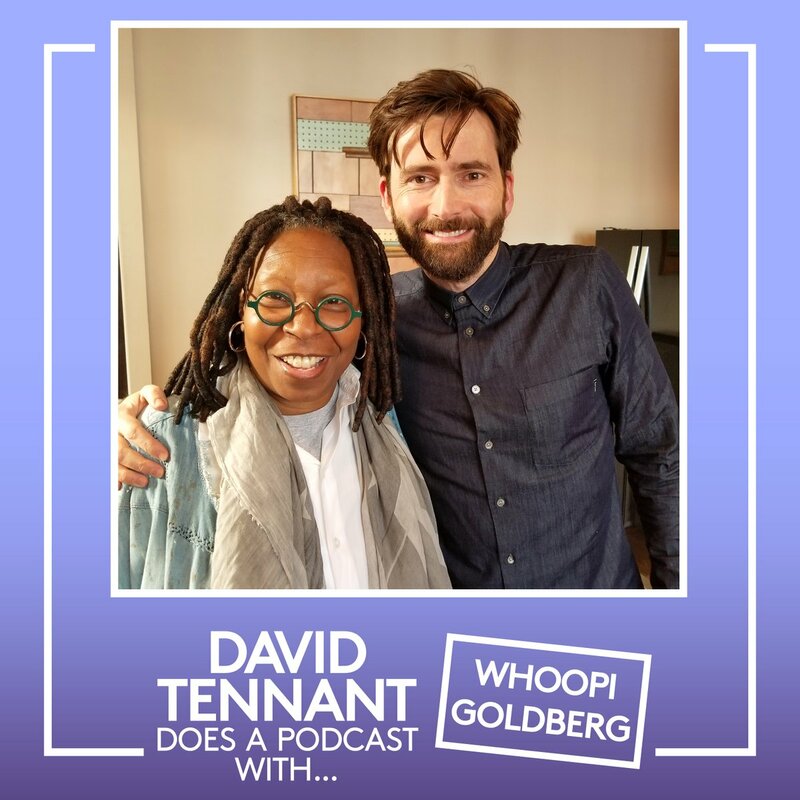 A short clip of David Tennant confirming his next podcast will be with Whoopi Goldberg (which will be released tomorrow) has been posted online. David Tennant is a guest on the Hometime Show on Absolute Radio today. The show is hosted by Andy Bush and Richie Firth and is on air between 4pm and 7pm. Mad To Be Normal has its UK television premiere when it is shown on Sky Cinema Premiere at 11am today with a repeat on the same station tonight at 10pm. Mad To Be Normal is The Times Film Choice for tomorrow. David Tennant Daily News Digest for Saturday 2nd February 2019 (4 items). Photo ops with David Tennant and Matt Smith together are available for Chicago Comic And Entertainment Expo (C2E2) fan convention on Saturday 23rd and Sunday 24th March (plus solo ones with David). The broadcast of new DuckTales episodes resumes in the UK today. The episode Sky Pirates... In The Sky! premieres on Disney XD this morning at 9.30am with a repeat at 5.30pm. David Tennant Daily News Digest for Thursday 31st January and Friday 1st February 2019 (25 items). David Tennant will be a guest on the Hometime Show on Absolute Radio on Monday (4th February). Sadly Clive Swift (who played Mr. Copper in Voyage Of The Damned) has passed away. A video clip of David Tennant speaking about that eggplant emoji has been posted online. David Tennant is one of the stars featured in the Tapestry Of Paisley Icons. A video clip of David Tennant speaking about Doctor Who has been posted online. A photo of David Tennant, Zoe Ball, Sue Perkins and Sigrid has been posted online. A fun photo of David Tennant at The Zoe Ball Breakfast Show has been posted online. A photo of David Tennant and all the cast in The Zoe Ball Breakfast Show studio has been posted online. MP3s of David Tennant on The Zoe Ball Show on BBC Radio Two today. A photo of David Tennant in The Zoe Ball Breakfast Show studio has been posted online. David Tennant said on The Zoe Ball Breakfast Show this morning that next podcast will be with Whoopi Goldberg (on Tuesday he thinks) followed (he thinks!) by Jodie Whittaker the following week. Another photo of David Tennant on The Zoe Ball Breakfast Show this morning has been posted online. A photo of David Tennant and Sue Perkins has been posted online. The first photo of David Tennant on The Zoe Ball Breakfast Show this morning has been posted online. David Tennant Does A Podcast With... is one of The Guardian's Podcast Picks Of The Week. David Tennant is a guest on The Zoe Ball Breakfast Show on BBC Radio Two this morning. Mary Queen Of Scots is released in Estonia, Finland, India and Lithuania today.